I’ve been meaning to put together a running plot of U.S. smartphone marketshare for some time. The monthly press release from the market research firm comScore contain enough information to do it, but you have to stitch a number of them together as they only report the covered month and the third previous month. Stitching all the data together is actually rather revealing. First, the raw numbers. All the rows are market share percentages except the last, “Smartphones”, which is the total size of the smartphone userbase in millions. The March 2010 figures are missing because of a retrieval glitch on the comScore website; I’ve been promised the relevant document will be restored and the numbers mailed to me. It’s unclear what’s going on with Apple, but there are a couple of conspicuous absences in its trend. There’s no bump from the iPhone 4V release at the beginning of February, and no obvious effect from all those cheap 3GS refurbs that AT&T has been flogging. It looks rather as if Apple marketing is running as fast as it can to stay in place, and not very much as though Apple is capturing a lot of dumbphone conversions. I’ll update these figures and post another plot when the April report comes out. In the meantime, talk amongst yourselves. UPDATES: I was able to get more historical numbers, clear back to December 2009, and one of my records has calculated a good estimate of one I was missing from comScore’s data. The post has been revised accordingly. Any comment on MS’s purchase of Skype and relationship with (and IMO likely purchase) of RIM? I’ll chime in. MS buying RIM doesn’t seem to me to make much sense. They already own Nokia, RIM at this point has nothing much but customers who are loyal to a different OS and the stench of failure, and I don’t think even Balmer is dumb enough to try to tie those bricks together. Skype is interesting. That could be a big deal, if Microsoft can manage it. I half expect to see them fumbling on the business market – they’ve never been any good at net services, and their instincts are to wrap everything around Office (make calls from your spreadsheet!). But people like Skype a lot, and it is the sort of service that people tend to take a lot of abuse to keep before giving up. That said, I see a potentially interesting long-term disruptive game to be played with the Xbox. If they get gamers used to using integrated skype in games to trash talk your buddies, they have an angle to cross over with VOIP in smartphones tied to a social graph. I don’t know if this is what they’re thinking, but some of this starts looking very _Rainbows End_ to me. But again, I have trouble seeing them managing Skype well. The purchase price smells desparate, they’re historically lousy at these sorts of things, and Ballmer is still in charge. It’s almost not worth mentioning, but the 4th column caption from the left should read “Oct2010“. It looks rather as if Apple marketing is running as fast as it can to stay in place, and not very much as though Apple is capturing a lot of dumbphone conversions. Here’s an interesting pseudo-fact from playing with the numbers with google docs. If my calcs are correct(and the results don’t match what i’d expect so i’m not sure i trust them), then even “death dive” RIM picked up 4.6M users over 2011Q1 which is just shy of Apples 4.8M extra users. Android picking up 6.8M users doesn’t seem nearly as impressive somehow even if it is more than everyone else bar themselves and RIM combined. Even Palm picked up 340K users. If these numbers are right then it’s possible that dumbphone conversions are going to keep everyone alive for a little while yet. Perhaps the one little light in the NoWin/RIM tunnels is that if there’s a time when hemmoraging market share is survivable in the short term it’s now. > Palm and Microsoft are losing customers by slow erosion rather than a RIM-like crash. Actually, if you look at market share loss in proportion to initial market share, Rim, Microsoft, and Palm have lost 28%, 31%, and 39%, respectively. Rim and Microsoft seem to be crashing at a similar rate with Palm being the bigger loser. MS buying Skype smells of utter desperation. $8B for a company that never made a profit and has no business plans for making profit. What MS buys is an installed base and a codec. Building a better codec is hard, but not very hard. And with increasing bandwidths, compression rates are not that important anymore. There are currently several groups that try to build competing FOSS codecs. The installed Skype base is becoming worthless. It should be straightforward to include an HTML 5 plugin in Firefox, Chrome, and Safari that includes two way audio/video and IM. To be integrated into the browser later. Both iPhone and Android are ideal distribution channels for such an application. Combined with IM (Jabber) and SSL as transport layer, you have most of what you need for connecting everyone using their Gmail/Yahoo or other address. And then we should think how the networks will think about WP7 running over VoIP. > It should be straightforward to include an HTML 5 plugin in Firefox, Chrome, and Safari that includes two way audio/video and IM. I’ve spent years building IP based audio/video conferencing systems. Let me tell you, it is NOT a straightforward endeavor. Sure, you can cobble together some codecs, a transport layer and use XMPP as a control channel, but you’ll run into a myriad of platform dependent and network dependent annoyances that will ruin the user experience in all but the best cases. You can dismiss Skype as much as you want, but their core functionality is top notch. There’s nothing that comes close on the market at this moment, either open source or proprietary. >> Palm and Microsoft are losing customers by slow erosion rather than a RIM-like crash. >Actually, if you look at market share loss in proportion to initial market share, Rim, Microsoft, and Palm have lost 28%, 31%, and 39%, respectively. 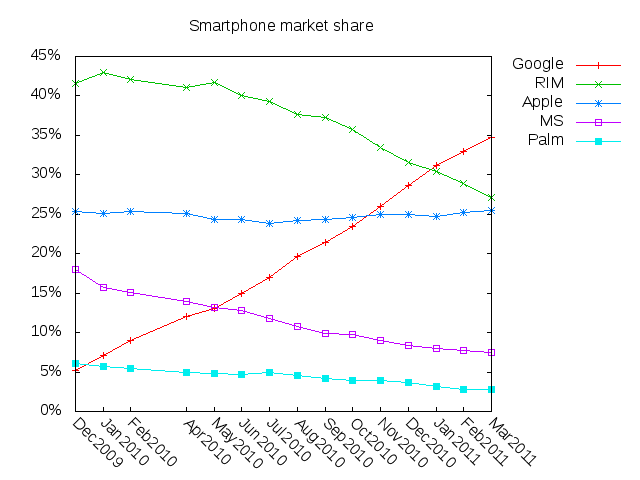 Rim and Microsoft seem to be crashing at a similar rate with Palm being the bigger loser. Looking at it another way, multiplying the installed base by the market share, even RIM has only lost 5% (1.03 million of 20.68 million, from the numbers in Eric’s table) of last August’s existing customer base. Not good but not necessarily catastrophic, if they can settle for being niche, and can carve out and maintain a reliable niche. Interesting. I did exactly the same thing yesterday (collected ComScore’s numbers and graphed them) except I took the numbers back to November 09. My interest at the time was to evaluate MS’s decline. Comscore (or anyone else that provides this data afaik) deosn’t break out Windows Mobile/WP7. They show aggregated share. Since the loss of market share before 4Q 2010 was due to declining Windows Mobile share, and the share since then shows the combined effect of WP7 (increasing) and Windows Mobile (still declining), I was hoping to estimate where the bottom might be and when it might occur. Re WP7, it seems that the rate of MS market share decline has slowed somewhat. Whether this is due to the effect of WP7 or is simply an asymptotic effect is not clear. Several more data points would be helpful. We’ll see. The rest of the graph was surprising for the reasons you mentioned. iOS’s flat share, the almost linear progression of Android, etc. Since my graph goes back further, it shows something else not apparent in the numbers since August 2010. During the period from November 2009 to May of 2010, the major decliners were Windows Mobile and Palm. RIM holds steady during this period but begins its decline in June 2010. I wish there was a similar source for global market share, but I haven’t found it yet. I don’t think you calcs are right. Your calcs are better, but I think it’s closer to 6% total loss for RIM due to the error in the table. Skype? The Android version is incredibly buggy, I have to restart it every 2 minutes because voice becomes so noisy due to some leakage. And the Android version has no video. In the Windows Desktop world they may be the best way to keep in contact with your parents from afar, but in the mobile field they are not that significant. Personal opinions. Two positives and a cautionary caveat. +1: It’s obvious from the graph that RIM users are switching to Google. Want to see Android 3.0 / Honeycomb on more tablets or smart phones? It ain’t gonna happen. It looks like Google will never release Honeycomb, waiting on Ice Cream (Android 4.0) to be the open source release. Wow, just wow. That’s like throwing a 6 month to 1 year monkey wrench into the current OODA cycle, meaning that companies not in bed with Google will have to hire software developers of their own, if they want to stay competitive. I foresee lots of regengineering effort happening as companies start replicating 3.0 functionality on the 2.x base. >It looks like Google will never release Honeycomb, waiting on Ice Cream (Android 4.0) to be the open source release. Wow, just wow. You are completely out to lunch. For one thing, Ice Cream is 3.1, not 4.0. The percentages all match your numbers for August, but they say “55.7 million people in the U.S. owned smartphones during the three months ending in August”. Aha. I had to compute that number from the number for three months later and a quoted percentage rise, because your document has fallen off the list of accessible press releases. Someone typoed that percentage, I guess. I will correct. Did you mean to link a different article? There is nothing in that link that isn’t already known, that Google keeps pre-release code in-house to keep vendors from building against an API that isn’t finished yet. There is nothing about Honeycomb or Ice Cream there. I think you mean rows. That’s because your plotting 3-month moving averages, not month-on-month share. Read the comScore reports more carefully. >I think you mean rows. >That’s because your plotting 3-month moving averages, not month-on-month share. No, I got that all right. They’re using moving averages as a noise filter; pretty standard technique for this kind of analysis. We’ve got 7 months of data, so the averaging isn’t going to suppress wobbles over the whole period. I wonder if “smartphone market” is an agglomeration of semi-related things, though. I think it may be three markets – business phones, cheap consumer smartphones, and high-end consumer smartphones. At a guess, RIM still has dominant share in the mostly static business phone market, the rapidly growing low-end consumer smartphone market is rapidly moving from RIM+miscellaneous to Android+miscellaneous, and Apple maintaining high share in the high-end smartphone market with Android gradually nibbling away at the smaller players. 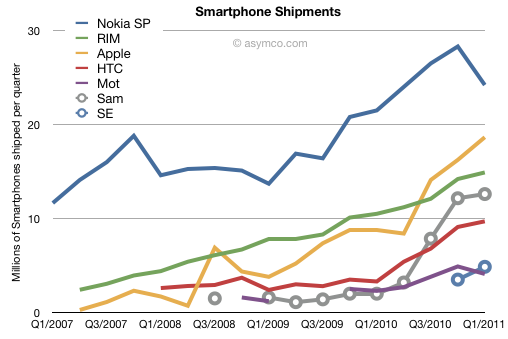 >At a guess, RIM still has dominant share in the mostly static business phone market, the rapidly growing low-end consumer smartphone market is rapidly moving from RIM+miscellaneous to Android+miscellaneous, and Apple maintaining high share in the high-end smartphone market with Android gradually nibbling away at the smaller players. Yes, this seems like a pretty plausible model based on everyone’s positioning. But under these assumptions I think it would require an implausible set of numerological coincidences to explain Apple’s essentially flat trend line. Something else is going on, but I don’t understand what yet. Why not attribute it to Apple engineering or management rather than marketing? Seems a little (ok, a lot) mean-spirited. >No, I got that all right. They’re using moving averages as a noise filter; pretty standard technique for this kind of analysis. We’ve got 7 months of data, so the averaging isn’t going to suppress wobbles over the whole period. Oh, ok. It seemed a bit inconsistent to observe the lack of noise when looking at noise-filtered data. You can see an effect. The three months before February (Jan 2011 on the chart) are the lowest ever, the market share then recovers. On a chart that smooth, that’s signal (all other lines are monotonic). Your point remains valid though. >Oh, ok. It seemed a bit inconsistent to observe the lack of noise when looking at noise-filtered data. My bad. I should have been clearer that I was referring to herky-jerkiness at the per-quarter level and up. >Really, this is good news. While users are trying to figure out whether to download “Skype Live Small Business Edition” or “Skype For Windows Professional Platinum 7.0”, some startup will eat their lunch. > +1: It’s obvious from the graph that RIM users are switching to Google. Actually, that might require some elucidation. It’s not all that obvious to me. I think, based on the good technology report, that a lot of business users are moving from RIM to Apple. Apple gained many times what RIM lost, so this is plausible. Then, probably dumbphone users mostly moving to Android. This makes sense from a cost-sensitivity viewpoint. Anybody with an expired RIM contract probably paid a pretty penny for the phone back when, and can afford to do the same again. >Then, probably dumbphone users mostly moving to Android. I think so too. Notice that in the revised numbers and chart I just uploaded (with more history, including before RIM began its dive), there’s no correlation between RIM’s fall and Android’s rise. That correlation is something I’d expect to see if Android were mainly taking share from RIM; rather, it looks to me like Android is eating everyone’s lunch pretty impartially. However, looking closely, it looks like RIM’s drop levels off a small amount in December 2010, and then increases again, but Apple sees an increase in its rate, while Google levels off a bit more from Jan 2011 onward. So you may be correct there. It’d be nice to see a first-derivative of the shown chart. That was a good observation before I got the numbers back to December 2009. Now we can see the symmetry was an artifact of the reporting period. With more data, Android’s rise doesn’t seem to be well-correlated to RIM or anyone else’s fall. I think that there’s a problem with the existing graph: specifically, it only graphs relative market share, not absolute market size. Given that over the course of the graph, the absolute market size increases by 30%, RIM losing 10.5% market share still means that they increased their market size by 16.35%. It would be interesting to see the same graph done by market size, not just market share. >It would be interesting to see the same graph done by market size, not just market share. I agree. There’s a problem, though, in that I’m missing a crucial number right at the beginning of the sequence. As soon as I can dig that up I’ll make a run at this. Where are all the other iPhones? Probably similar dynamics at work with Android, but we don’t know carrier shipments of those. It’s true… the share number for Apple is really implausibly flat. Two popular theories going around about Apple are that a) they want to milk a niche for profit, not fight for share, and; b) Once Apple’s share drops far enough, their market will collapse due to network effects et al. Suppose Apple believes both those ideas? We’d then expect them to milk their user base to the extent possible while maintaining a certain minimum share. Maybe all the 3GS refurbs, Verizon availability, etc. were profit-reducing tactical maneuvers aimed specifically at keeping iPhone at a 25% share target they think is critical to maintaining platform viability? >Maybe all the 3GS refurbs, Verizon availability, etc. were profit-reducing tactical maneuvers aimed specifically at keeping iPhone at a 25% share target they think is critical to maintaining platform viability? That’s as plausible a theory as anything I’ve been able to come up with. MS buying Skype means a big payday for the hedge fund that bought Skype from eBay for $1.9 billion. They overpaid. I wish we had solid, trustworthy data that separated smartphone upgrades and provider-switching smartphone sales from new-smartphone-user sales (mostly upgrades from dumbphones, but would also include first-time cellphone buyers). Without that data, it’s difficult to test the hypothesis that Android is getting the vast bulk of dumbphone upgraders and new phone customers, while still being competitive among switchers. What would this chart look like if all of the category growth was removed, leaving only brand-switching effects? > What would this chart look like if all of the category growth was removed, leaving only brand-switching effects? 43% of 42.7M smartphones is 18.36M and 7.8% of 234M total handsets is 18.25M, a discrepancy of under half a percent. Yes, I believe that figure. It’s within a half a percent of what interpolation would predict. Now let’s see if my contact at comScore comes through with figures for March. Do you have any decent source for total cellphone subscribe userbase over this period? > Do you have any decent source for total cellphone subscribe userbase over this period? I thought comscore had been pretty consistent about putting that at the top of their reports, no? >I thought comscore had been pretty consistent about putting that at the top of their reports, no? I’ve looked at about half their reports with this in mind, beginning and end of range, and they all say 234 million. The size of the figure is credible, but for it not to have changed in 18 months is not. Or do you mean total, as in including kids 12 and under? That’s a bit difficult, because there are a lot of prepaids, that aren’t necessarily always carried. But Neilsen or somebody might have survey-based numbers. No historical numbers. But obviously, that double-counts people with work and home cellphones, people who switched in disgust or had a broken phone, etc. I’m sure somebody’s done a survey of teen and pre-teen cellphone use. Haven’t found the right terms to get good data, though. Unfortunately, you have to be careful about connection numbers, because they can include meters, GPS trackers, Kindles, etc. Usually, the carrier quarterlies (esp. Verizon and AT&T, since they’re the big dogs) give you enough information to reasonably split out handsets from other connections. You’re as good or better than I am at that kind of sleuthing; by all means go to it. I’m going to experiment with ways to visualize the data that might be revealing – plotting deltas, or scaling against total userbase, that sort of thing. OT: Sprint says in Senate hearings that an AT&T / T-Mobile merger threatens its existence as an independent company. Pretty strong language from the #3 player in a multi-billion dollar industry. And indeed they weren’t. If i were fully awake at the time I would have realised that over 17M increase in users over a time period that grew by roughly 9M was bogus. In the clear light of midday the next day i wondered what i was smoking at the time. The new numbers i’m looking at (much more sensible ones) say Android increased by 7M “comscore users” (i.e. smartphone users as defined by Comscore), iOS by 2.7M, Rim and Palm both lost around 300K and MS gained 128K. I don’t think that supports my original point anymore but note that when you bring it to numbers it shows that the majority of gains by the big players are definitely coming from new smartphones. Even if all of the “smartphone conversions” (i.e. people switching from one smartphone to another) went to Apple, they’re still getting a little more than 2M extra(assuming that no-one switched away from MS, which is a terrible bet to make but i don’t have figures on hand to do otherwise). >I don’t think that supports my original point anymore but note that when you bring it to numbers it shows that the majority of gains by the big players are definitely coming from new smartphones. Yeah, that’s been my take on the numbers for several months now. And Patrick’s, too. Right. I think there’s no question that dumbphone conversions will have an effect, the question is how big that effect is. My wacky numbers seemed to support a “swamp everything else, even being crap” conclusion. This tends to say to me “swamp everything else, except maybe being crap” instead. Should Microsoft worry? Yeah, I think so. They’ve got Apple making in-roads on the business desktop front with tablets and smartphones, may other companies, like HP, are also going after the business desktop with tablets, and now Google has finally thrown down the gauntlet on the business desktop. I must say I am much less optimistic. Inroads into businesses are very difficult. But this Chromebook could still create a sizeable market for Linux. $28/month? I recall MS trying a subscription model before and it dying for lack of interest. Perhaps Google will make it work. But everyone’s web based? Ok.. but many of those business apps are _ActiveX_ based. Which means no chrome book. Christ half of the “web based” applications where i currently work don’t even support IE9… Firefox or chrome are right out. So that means a chrome book would not be able to access A) our CRM, B) our telephony administration(including statistics) C) our telephony client or D) our Call recording solution. Of these, three of which (not sure about call recording) would need to be completely redeveloped to work with something other than IE on Windows. Of those three, we have the code for one. Personally I really hope i’m wrong… but certainly where i sit right now, I highly doubt it. Mobile computers are a huge security headache. They get stolen/lost etc. You really want them to be replaceable. Enter web/cloud based computing. What Google is offering is a safe disposable platform for mobile computing. It can be lost or cracked, but there is no data on it. And with remote maintenance, it is much more difficult to mess it up with malware. For only $350 a year, that is a great offer. Most ICT departments ask ten times that amount. And Google shed a single tear if it helps kill ActiveX. On the contrary. I have mixed opinion on this. I believe many businesses will be adopters, especially those who have web-based client side computing (Travel and Airlines jump into mind). In many ways, I think it might actually be businesses that might give the Chromebook success. Don’t get me wrong, i’m not saying chrome book will bomb and no-one will get it. And _some_ businesses (those who’ve successfully avoided being suckered by “enterprise-grade” software) will probably make a killing in savings. I just don’t see this rosy future where even a majority of businesses start ditching windows as a desktop because chromebook comes out. Like i said, I hope i’m wrong. I firmly believe that cloud computing is one of dumber “silver bullets” to hit IT. There’s some things that cloud computing is good for but moving your internal business infrastructure onto it lock stock and barrel is inviting trouble. I consider Gmail and Dropbox as cloud computing. I often use Google Documents for light one-off collaborations (say, writing an invited piece for a web site). Anything beyond that would be YMMV. I *want* to think that also. But several of my small business clients have moved to cloud-based solutions and been very happy for it. It really simplifies a lot of things. But the silly dependence on IE and ActiveX is a real problem. Dealt with one just the other day where the provider made a (New! Improved!) update to their online app and it will run only on IE7 or 8. Not IE6 or IE9 and forget Firefox, Chrome, Safari or Opera. One would think web developers would be steeped in standards-based development, but I’m beginning to think the *average* web developer is little more than a 90 IQ corporate lackey they found at the Unemployment Office. Depressing. I saw that and meant to write about it, because something there makes my head spin. Another statement from the same session was that there have been 4.5 billion android app downloads. That’s an average of 45 apps per Android activation. I suppose that could help lend credence to google’s claim that they don’t count hardware upgrades as device activations, and I suppose (don’t know) that some phones have limited room, so you might load an app, kill it, then reload it, but even so — that number is a whole order of magnitude bigger than I would have expected. I have downloaded more apps than that. And deleted quite a number of them again. And I could do that because I downloaded free apps. I generally try out several different free apps in a category and keep only the ones I actually like. And if I need room, I remove those apps I do not plan to use. I can always reinstall them if I want. > That’s an average of 45 apps per Android activation. That wouldn’t surprise me; I just did a count on my phone of downloaded apps: 80. A handful of those are actually paid-for, too. And I am not a ‘there’s an app for everything’ type of person; I only check out the Market when I’m bored and have some time to kill. I’m actually surprised my count is that high. Chrome is a solution looking for a problem. I cannot imagine a scenario where ChromeOS wins enough support to make even a small dent in the marketplace. It’s going to be Android or iOS on phones and tablets, while Windows will continue to dominate desktops and laptops. The netbook and lower end laptop category that the Chromebook is targeting will completely disappear – it will be replaced by tablets with integrated but detachable keyboards, ala the ASUS Transformer. -Do everything on the web, Google Docs, etc. They also showed some amazing graphics; the thing was running 10,000 sprites with a good framerate. Anyone tried out one of these? They should be on sale soon. That was the idea behind HTML, but it doesn’t seem to have worked out that way. Too much incentive for Microsoft to poison the standard, too many corporate Microsoft-shops who don’t seriously evaluate alternatives to IE for the standard corporate browser. hsu is right. The netbook is dead. It was the iPad in the conservatory with the candlestick. > The netbook is dead. It was the iPad in the conservatory with the candlestick. To the extent that a netbook is an underpowered notebook with a small screen, no peripherals, and a crappy little keyboard, it makes absolute sense for it to be replaced with an underpowered notebook with a small screen, no peripherals, and a virtual keyboard. Atrix 4G with their webtop already came first. >Atrix 4G with their webtop already came first. True, but unfortunately irrelevant. AT&T unsurprisingly price it so ridiculously high you’d be better off to buy an Inspire 4G and a high-end laptop and probably still have $100 left over in spending money. The Atrix won’t have much lasting impact other than as an example of what not to do. Pity, as it appears to be a good machine (despite Motorola and AT&T). > You are completely out to lunch. For one thing, Ice Cream is 3.1, not 4.0. For another, it’s Ice Cream Sandwich, not Ice Cream. Still the original point remains, no 3.x source code until late thus year, or early next. This effectively locks out any but google’s selected Honeycomb partners. So either China/Korea fork Android, or that whole market stagnates. Looks bad for the $85 phone. I don’t think you understand what tablets replace. Tablets are NOT meant to be a general purpose laptop replacement. They are meant to be your second computer. Because it is a second computer, it does not need to be anywhere as powerful as your primary computer, since you have a fall back when you need to do more. I think the Atrix is the wrong solution. I think what we will eventually see is a world of tablets and cellphones, with docking stations replacing the concept of a laptop or a desktop. That is, I foresee concepts like the Asus Transformer replacing laptops because it is basically a tablet with a keyboard dock. I do not see cellphones replacing tablets because attaching a cellphone to a tablet makes the tablet too bulky and unwieldy. Thus, I think they will remain two separate categories. I expect the normal case to be where the tablet syncs with your cellphone, so that you can move back and forth between the two seamlessly. I wonder who AT&T marketing thought the target would be at that price? This brings back memories of Motorola’s Iridium; did they *really* think there would be enough buyers for airtime at $3/minute to pay for the satellite network? But for Atrix, I’m sure there will be plenty of successors at more reasonable prices. What’s so terrible about building the $85 phone on Gingerbread? Price-sensitive customers don’t expect the latest and greatest. > But for Atrix, I’m sure there will be plenty of successors at more reasonable prices. Yes. Pity ASUS isn’t a bigger brand. Their Transformer seems to come pretty close to getting it right for current generation technology. And at a price that seems at least sane. But I expect this category to have an OODA loop only slightly larger than the Android phones. Anything bought now will look archaic in a few months. I don’t think you understand what tablets replace. Tablets are NOT meant to be a general purpose laptop replacement. They are meant to be your second computer. Because it is a second computer, it does not need to be anywhere as powerful as your primary computer, since you have a fall back when you need to do more. Please elucidate exactly how that masterful exposition of your superior understanding differs significantly enough from my feeble thoughts to cause you to question my limited understanding of the world. > What’s so terrible about building the $85 phone on Gingerbread? Andy Ruben is in an all-out war to stop fragmentation. Andy Ruben wants phones built his way (dammit). He’s putting the band back together. Watch out, HTC, Samsung, and Motorola. >Watch out, HTC, Samsung, and Motorola. I thought Google was getting set to do this a year ago. They apparently decided on a more Taoist approach then; interesting that they think they have enough leverage to take a harder line now. Amazon MP3, Google Calendar, Earthquake (which replicates the functionality of http://quake.wr.usgs.gov but is better packaged), Facebook, Geohash Droid, Gmail, Google Search, Google Reader, Yahoo Mail, Google Maps, Google News, Pandora, Google Translate, Twitter, Weatherbug, and YouTube. > interesting that they think they have enough leverage to take a harder line now. It’s probably a combination of several things. For one thing, an average of 45 downloaded apps per activation is some leverage — vendors probably wouldn’t dream of releasing a phone that can’t access the market. And for another thing, the vendors now have extensive real-world knowledge of exactly how much Android costs them and earns them. They know the per-user revenue sharing number vs. the per-user incentives they had for installing crapware. And they know how much it’s worth to be on google’s early-release list, and can assume that if they piss off google, that will never happen for future releases. When they do the math, the final answer probably says to agree to whatever google asks for. My wife just pointed out something which keeps RIM in the fight: Other People’s Money. RIM serves the corporate market, and does so very well. Corporations which issue their employees smartphones get a pretty good package with RIM, including exchange integration that’s the equal of (if not better than) WinP, some level of lock-downability, and”remote wipe”. Your employee calls in – they lost their phone. No problem – IT types in a few things, and suddenly that phone is a clean blackberry with no data on it. I’ve seen very few people get Blackberries with their own money, but RIM probably still has the best options for corporate deployment. That may change, if someone is willing to put the work into making Android more corporate-friendly *and* selling it as such. I doubt that Apple will go that route, but they do have the capability to. > I doubt that Apple will go that route, but they do have the capability to. Apple said in July that more than 80 percent of the Fortune 100 companies are deploying or testing the iPhone. The Cupertino, California-based company has taken steps to improve the iPhone’s security, such as strengthening encryption tools, adding the ability to set longer passcodes and integrating with servers that could wipe out or lock an iPhone if it’s lost. More companies are set to follow suit, according to an August survey done by Sanford Bernstein. Of 200 companies polled in the U.S. and U.K., 74 percent now let their employees use devices other than BlackBerrys, the research showed. For the U.S. alone, the figure was 83 percent.